Google Play, originally the Android Market, is a digital distribution platform operated by Google. It serves as the official app store for the Android operating system, allowing users to browse and download applications developed with the Android SDK and published through Google. Google Play also serves as a digital media store, offering music, magazines, books, movies, and television programs. Users can also purchase hardware devices through the service, such as Chromebooks, Google Nexus-branded mobile devices, Chromecasts, and accessories. 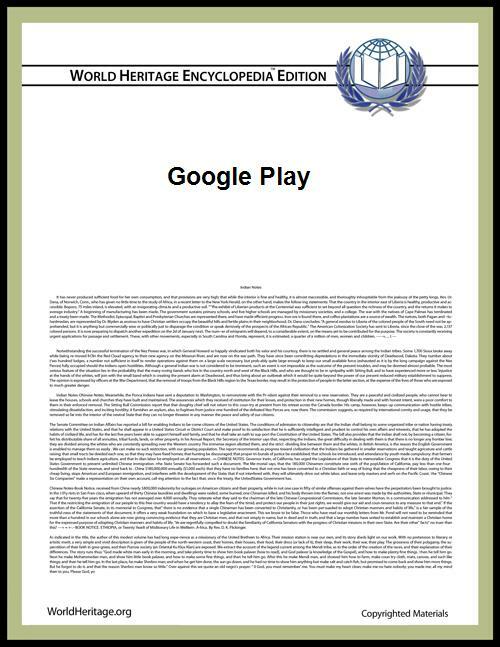 Google Play was launched on March 6, 2012 with the merger of Android Market, Google Music and Google eBookstore, marking a shift in Google's digital distribution strategy. The services operating under the Google Play banner are: Google Play Music, Google Play Books, Google Play Newsstand, Google Play Movies & TV, and Google Play Games. The Google Play store has reached over 1.3 million apps published and over 50 billion downloads. Google Play makes free-of-charge applications available worldwide (except countries under United States embargoes), while paid applications are available in 135 countries. Applications can be installed from the device using the Google Play Store app or through the Google Play website on a PC. According to AppBrain Stats, there are over 1,400,000 applications available as of November 2014, of which over 1,200,000 are free and over 200,000 are paid. Google seems to remove low-quality apps from the store roughly once a quarter, when the number of available apps go down. As of November 2014, developers in 61 countries were able to distribute paid applications on Google Play. To distribute apps, developers have to pay $25 as registration fee for a Google Play Developer Console account. Google states that this fee is charged to encourage higher quality products on Google Play. Application developers can control which countries an app distributed in, as well as the pricing for the app and in-app purchases in each country. Developers receive 70 percent of the application price, while the remaining 30% goes to distribution partner and operating fees. Revenue earned from the Google Play is paid to developers via Google Wallet merchant accounts, or via Google AdSense accounts in some countries. Google Play allows developers to release early versions of apps to a select group of users, as alpha- and beta-testing versions. This allows the developer to fix any issues before the app is released widely. Google Play also allows developers to release updates in stages, first to a subset of users and then progressively to larger portions of the userbase, ensuring that the smallest number of users are affected by any issues missed in testing. Some carriers, such as Sprint, offer direct carrier billing for application purchases. Purchases of unwanted applications can be refunded within 15 minutes of the time of download. Applications meeting certain design criteria set by Google can be made compatible for Android Wear and Android TV devices, and for the Google Fit platform. On March 17, 2009, about 2,300 applications were available in Android Market, according to T-Mobile chief technical officer Cole Brodman. On May 10, 2011, during the Google I/O, Google announced that Android Market had 200,000 applications listed and 4.5 billion applications installed. In October 2012, Google announced that Google Play had 700,000 apps available to download, matching the number of apps in Apple's App Store. On July 24, 2013, Google announced that the Play Store now had one million applications listed and had seen over 50 billion downloads. Google Play offers an online music store with over 22 million songs, cloud storage of up to 20,000 songs at no cost, and a subscription music streaming service called All Access. Songs are priced at US$1.29, $0.99, $0.69, and free. Google Play Music is currently available in 58 countries. Purchase of books is currently supported in 57 countries. Google requires users to provide payment information even for downloading free ebooks. In addition to downloading books from Google Play, users can upload books in the PDF or EPUB formats, which are stored in the cloud free of charge for up to 1,000 books. Publishers and authors can publish their books for sale on Google Play through the Play Books Partner Centre. Google mandates publishers selling their ebooks on Google Play to also make the book available for a limited preview on Google Books. The publisher can set the percentage of the book to be made available for preview. Google first began selling ebooks online through the Google eBookstore, which was launched on December 6, 2010, in the United States with over 3 million titles. It became a part of Google Play when the latter was launched. According to Google, there are thousands of movies and television shows available on Google Play Movies & TV, some in HD, including comedy, drama, animation, action and documentary. Movies can be rented or purchased and watched on the Google Play website or via an application on an Android device. Some titles are only available for rental, some only for purchase, and others for both rental and purchase. TV shows can be purchased by episode or season but cannot be rented. Alternatively, users can download movies and TV shows for offline viewing and view them later using the Google Play Movie app. Movies are available in 70 countries. TV shows are available only in Australia, Canada, Japan, the US and the UK. The app reached over 500 million downloads in October 2014. Google Play serves subscriptions to free and paid news publications, and magazines for reading on Play Newsstand. At the time of the launch of Play Newsstand, about 1,900 free and paid news publications were available. All magazines offer a free 30 day trial, while the free trial period for news sources differs. Subscriptions to paid content is currently supported in Australia, Canada, France, Germany, India, Italy, Netherlands, Russia, Spain, United Kingdom and United States. The Devices section of the Google Play store allows customers to purchase Google Nexus mobile devices, Chromebooks, other Google-branded hardware, and accessories. Google Play sells the Nexus 5 smartphone for $349 with 16 GB of flash storage unlocked with no contract required. At the Google I/O Conference in June 2012, Google announced the Nexus 7 tablet computer for $199 with 16 GB of flash storage and $249 with 32 GB of flash storage would be made available for purchase through the devices section of the Google Play store. The Nexus 5 is currently sold in Australia, Canada, France, Germany, India, Italy, Japan, South Korea, Spain, the United Kingdom and the United States. The Nexus 7 is currently sold in Australia, Canada, France, Germany, India, Italy, Japan, South Korea, Spain, the United Kingdom and the United States. The Nexus 7 3G is currently sold in Australia, France, Germany, Spain, the United States. The Nexus 10 is currently sold in Australia, Canada, France, Germany, Japan, Spain, the United Kingdom and the United States. At Google I/O 2013, it was announced that a special edition of the Samsung Galaxy S4 with stock Android 4.2 would be made available on Google Play on June 26, 2013. Likewise, on May 30, 2013, HTC announced that a similar version of the HTC One would also be released the same day. On November 20, 2013, Google launched Google Play Newsstand which combined the features of Google Play Magazines and Google Currents into a single product, which serves subscriptions to magazines, web feeds and server-generated topical feeds. All topical news feeds are free and can be subscribed only from within the app. Priced news sources and magazines can be subscribed from the Google Play Store app on Android or the Google Play website on any device, while free news sources can be subscribed from both within the app or from Google Play. Reviews and ratings can be submitted for all Newsstand content distributed through Google Play. All subscribed topics, feeds, sources and magazines are synced across devices signed in with the same Google account. Play Newsstand features about 1,900 free and paid publications. The app automatically formats articles for reading on a phone or tablet, complete with images, audio or video inline. Articles are cached on the device for offline reading. Most paid publications allow users to read up to 10 articles per month for free. All articles on Play Newsstand are tagged with the name of a broad generic topic. Subscribed topics show up as tabs on the app's home screen. Play Newsstand also supports RSS feeds. Many formats of RSS content, however, are not supported. Play Newsstand's home screen (the Read now view) displays articles on the basis of the user's interests which, according to Google, the app learns quickly. Play Newsstand allows users to bookmark articles for later reading. Play Newsstand was released for iOS in September 2014, as an update to the Google Currents app. The Verge noted that the user experience across Android and iOS was "nearly identical". In October 2014, Google released a major update for Play Newsstand on Android matching the look of the app with that of the newly released Android Lollipop. The update featured many aspects of Google's Material Design language with bigger images and lots of transitional animations. The reading experience for print magazines was also revamped. Google Play Games is a service designed for Android which features real-time multiplayer gaming capabilities, cloud saves, social and public leaderboards, and achievements. It helps users to discover new games by viewing what friends from Google+ are playing. It lists both games and friends on its home screen and lets users see highlights from both categories. This service is similar to Apple's Game Center. It started out only available in a limited selection of games such as Super Stickman Golf 2, PBA Bowling, World of Goo, Osmos HD, and a few others. The service was introduced at Google's I/O 2013 Developer Conference along with many other new services, and the standalone app was launched on July 24 at an event called "Breakfast with Sundar Pichai" together with the new Nexus 7, Android 4.3 and the Chromecast. According to Google, Google Play Games received over 100 million new users between January 2014 and June 2014, making it the fastest growing mobile gaming network of all time. The Android Market was announced by Google on August 28, 2008, and was made available to users on October 22. Support for paid applications was introduced on 13 February 2009 for developers in the United States and the United Kingdom, with support expanded to an additional 29 countries on 30 September 2010. In December 2010, content filtering was added to the Android Market and reduced the purchase refund window from 24–48 hours to fifteen minutes. Google eBookstore was launched on December 6, 2010, in the United States after extensive speculations regarding its release. It debuted with over 3 million ebooks, making it the world's largest ebookstore overnight. The international editions were to roll out beginning in early 2011. In February 2011, Google introduced a web client for Android Market that provides access to it via a PC. Applications requested through the Android Market web page are downloaded and installed on a registered Android device. In March 2011, Google added in-app billing to Android Market, allowing apps to sell in-app products. In May 2011, Google added new application lists to Android Market, including "Top Grossing" applications, "Top Developers", "Trending" applications, and "Editors Recommendations". Google's Eric Chu said the goal of this change was to expose users to as many applications as possible. 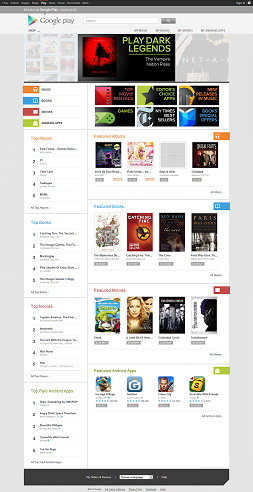 In July 2011, Google introduced a redesigned interface with a focus on featured content, more search filters, and (in the US) book sales and movie rentals. In September 2011, the Motorola Xoom tablet received an update that brought the redesigned Android Market to an Android 3.x Honeycomb based device. In November 2011, Google added a music store to the Android Market. In March 2012, the maximum allowed size of an application's APK file was also increased from 50 MB to allow two additional files for a maximum of 50 MB for the APK and two additional files of 2 GB each, totalling 4146 MB/4.146 GB. On 6 March 2012, the Android Market was re-branded as Google Play. On 2 May 2012, Google rolled out direct carrier billing for music, movies and books. On 24 May 2012, Google introduced in-app subscriptions to Google Play. On 12 July 2012, Google released update 3.8.15 which added Application Encryption functionality to help reduce application piracy. Since this update, many developers have noted compatibility issues causing various third-party widgets and keyboards to disappear after phone reboots or connecting to USB storage. Currently, a fix is planned for a future release of Android OS. Apart from searching for content by name, apps can also be searched through keywords provided by the developer. For the discoverability of apps, Play Store consists of sections such as Featured apps – showing apps meeting the Android design and quality criteria, Editor's Picks – showing the exceptional apps and games picked by the Google Play editorial team, Top Charts – showing the most popular apps and games overall and by category, and Tending – showing apps that are trending with other users. Existing apps that raise their quality can trend too. Play Store also features over 40 categories for browsing apps and regularly updated collections based on events and other interests. Google Play enables users to know the popularity of apps (and other content) by displaying the round figure less than the number of times the application has been downloaded. The numbers shown are the products of multiplying 1 or 5 to the powers of 10. These include 1 billion, 500 million, 100 million, 50 million, 10 million, 1 million, 500 thousand, 100 thousand, 50 thousand and so on. The 'number of downloads' actually refers to the number of Google accounts associated with an app. The number is not affected by the uninstallation of apps, neither is it affected if the app is later reinstalled using the same Google account. Google Play features a download history that allows users to view apps installed earlier without having to search manually. Purchased apps can be re-installed at a later date without having to re-buy it. Currently, however, there is no way to permanently delete or remove apps downloaded from the Google Play website (My Orders/My Android Apps). Since version 3.9.16, users are able to remove apps from the "All Apps" list on devices only. Many of the free apps on the store use advertisements and are freemium—free apps with in-app purchases used as the sources of revenue. The Google Play Store is the official pre-installed app on Android devices which provides access to the Google Play store. It allows users to browse and download music, books, magazines, movies, television programs, and applications from Google Play. The Devices segment of Google Play is not accessible through the Play Store. With the introduction of Google Play on March 6, 2012, the Android Market app on old devices was upgraded to the Google Play Store app. Play Store filters the list of applications to those compatible with the user's device. In addition, users may face further restrictions to choice of applications where developers have tied-in their applications to particular carriers or countries for business reasons. Carriers can also ban certain applications, for example tethering applications. There is no requirement that Android applications be acquired from the Play Store. Users may download Android applications from a developer's website or through a third-party alternative. Play Store applications are self-contained Android Package files. Play Store does not install applications; it asks the device's PackageManagerService to install them. The package manager becomes visible if the user downloads an APK file directly into their device. Applications are installed to the phone's internal storage, and under certain conditions may be installed to the device's external storage card. The Play Store application is not open source. Only Android devices that comply with Google's compatibility requirements may install and access Google's closed-source Play Store application, subject to entering into a free-of-charge licensing agreement with Google. In the past, these requirements had included 3G or 4G cellular data connectivity, ruling out Android-powered devices comparable to Apple's iPod touch, but this requirement had been loosened by the 2011 release of the Samsung Galaxy Player. Google places some restrictions on the types of apps that can be published, in particular not allowing "sexually explicit material", "Violence and Bullying", "Hate Speech", "Impersonation or Deceptive Behavior", copyrighted material (without permission), and a few other activities. Nevertheless, developers can still distribute the apps in .apk format and they can then be installed by users on their Android devices. “ On Monday, several applications that enable tethering were removed from Android Market catalog because they were in violation of T-Mobile's terms of service in the US. Based on Android's Developer Distribution Agreement (section 7.2), we remove applications from Android Market catalog that violate the terms of service of a carrier or manufacturer. As of May 20, 2010, PDAnet, Easy Tether and Proxoid were all available in the U.S. market for T-Mobile users. On 5 April 2011, Google withdrew the Grooveshark app from Android Market due to unspecified policy violations. However, the app is still available for direct download via Grooveshark's website for those users who have enabled non-market application downloads. On May 27, 2011, Google banned SpoofApp, a Caller ID spoofing application typically used for prank calling which had been available in Android Market since 18 December 2008. On 29 May 2011, Google banned the account of the developer of several video game emulators, including Nesoid, Snesoid, and N64oid and neither Google nor the developer publicly revealed the reason for the ban. In March 2013, Google began to pull ad blocking apps from Play Store (such as Adblock Plus) per section 4.4 of the developers' agreement, which prohibits apps that interfere with third-party servers and services. Google uses an in-house automated antivirus system, called Google Bouncer, to remove malicious applications uploaded on to the marketplace. This is meant to prevent repeat-offender developers, as well as check for anomalies in uploaded apps. Bouncer is credited to reducing malware by 40 percent between the first and second quarters of 2011. Lookout Mobile Security has reported that malware resulted in a loss of US$1 million in 2012. According to a 2014 research study released by RiskIQ, malicious apps introduced through Google Play store have increased 388% between 2011 and 2013. The study also revealed that the number of malicious apps removed annually by Google has dropped drastically, from 60% in 2011 to 23% in 2013. Apps for personalizing Android phones led all categories as most likely to be malicious. Before installing an application, Google Play displays all the permissions that an app requires. A game may need to enable vibration, for example, but should not need to read messages or access the user's address book data. After reviewing these permissions, the user can decide whether to install the application. Security software companies have been developing applications to ensure the security of Android devices. SMobile Systems, one such manufacturer, claims that 20% of apps in Android Market request permissions that could be used for malicious purposes, and 5% of apps can make phone calls without the user's intervention. This is not a claim that the apps are actually malicious, but rather highlight the potential for malicious activity. In early March 2011, DroidDream, a trojan rootkit exploit, was released to the Android Market in the form of several free applications that were, in many cases, pirated versions of existing priced apps. This exploit allowed hackers to steal information such as IMEI and IMSI numbers, phone model, user ID, and service provider. The exploit also installed a backdoor that allowed the hackers to download more code to the infected device. These apps were downloaded more than 50,000 times before Google took action and removed them from the Market. The exploit only affected devices running Android versions earlier than 2.3 "Gingerbread". In many cases, the only guaranteed method of removing the exploit from an infected device was to reset it to factory state, although community-developed solutions for blocking some aspects of the exploit were created. Google started remotely removing the malicious apps from infected devices on March 5, and also released its own app, the "Android Market Security Tool March 2011", which automatically removed the exploit. This app was automatically installed to all infected devices, and users with infected devices were notified via e-mail. In some cases applications which contained Trojans were hidden in pirated versions of legitimate apps. The rumor of Play Store gift cards started after references to it was seen in the version 3.8.15 update to the Play Store app. Soon after images of the gift cards started to leak, and on August 21, 2012 they were made official by Google and rolled out over the next few weeks. Google Play gift cards are currently available in Australia, Canada, France, Germany, Greece, Hong Kong, Ireland, Italy, Japan, Mexico, Poland, Portugal, Spain, Singapore, Switzerland, the United Kingdom, New Zealand and the United States. ^ "Google Mobile". Google.com. Retrieved 2013-06-10. ^ "Features". Google.com. Retrieved 1 May 2012. ^ "Introducing Google Play". Google. 6 March 2012. ^ Keach, Sean (August 11, 2014). "Microsoft says Windows Phone now touts 300,000 apps". ^ "Android's Google Play beats App Store with over 1 million apps, now officially largest". Phonearena.com. Retrieved 2013-08-28. ^ "About Google Play". Google. Retrieved 8 March 2012. ^ "Paid App Availability". Google Play Help. Google. Retrieved 7 March 2012. ^ "Google Play". Play.google.com. Retrieved 7 March 2012. ^ a b c "Number of Android applications". AppBrain Stats. AppBrain. Retrieved 26 November 2014. ^ "Free vs. paid Android apps". AppBrain. Retrieved 26 November 2014. ^ "Supported Locations for Merchants". Google Play. Retrieved October 19, 2012. ^ "Developer Registration". Google Play for Developer Help. Support.google.com. Retrieved 7 March 2012. ^ a b c d "The Secrets to App Success on Google Play". Google. Retrieved 15 November 2014. WorldHeritage has an article about the cited book. ^ "Transaction Fees – Google Play for Developers Help". Support.google.com. Retrieved 2012-10-29. ^ "Processing Orders and Receiving Payouts". Android Market for Developer Help. Retrieved 17 May 2011. ^ Chu, Eric (13 April 2011). "Android Developers Blog: New Carrier Billing Options on Android Market". android-developers.blogspot.com. Retrieved 15 May 2011. ^ a b Lawson, Stephen (17 March 2009). "Market Needs More Filters, T-Mobile Says". ^ a b Barra, Hugo (10 May 2011). "Android: Momentum, Mobile and More at Google I/O". The Official Google Blog. Retrieved 10 May 2011. ^ a b "Google Says 700,000 Applications Available for Android". Bloomberg Businessweek. 29 October 2012. Retrieved 5 November 2011. ^ a b c Warren, Christina. "Google Play Hits 1 Million Apps". Mashable. Retrieved 4 June 2014. ^ Wauters, Robin (16 December 2009). "Google: Actually, We Count Only 16,000 Apps in Android Market". ^ Chan, Casey (18 March 2010). "Android Market Has 30,000 Apps, Sort Of". Android Central. Retrieved 4 January 2012. ^ Nickinson, Phil (15 April 2010). "Android Market Now Has 38,000 Apps". Android Central. Retrieved 4 January 2012. ^ Hildenbrand, Jerry (9 September 2010). "Android Market Has More than 80,000 Apps, Android's Rubin Says". Android Central. ^ Andrew (16 July 2009). "Android Market Hits 1 Billion Downloads & 100,000 Apps". FoneHome. Retrieved 4 January 2012. ^ Gibb, Kyle (26 October 2010). "Android Market Passes 100,000 Apps". Android Central. Retrieved 4 January 2012. ^ Rao, Leena (14 April 2011). "Google: 3 Billion Android Apps Installed; Downloads up 50 Percent from Last Quarter". ^ Nickinson, Phil (14 July 2011). "Android Market Now Has More than a Quarter-Million Applications". Android Central. Retrieved 14 July 2011. ^ "Android Market Reaches 500,000 App Mark". t3.com. 23 October 2011. Retrieved 23 October 2011. ^ "Google Android Market". Distimo. 17 October 2011. Retrieved 18 December 2011. ^ Bonnington, Christina (8 December 2011). "Google’s 10 Billion Android App Downloads: By the Numbers". ^ Paul, Ian (4 January 2012). "Android Market Tops 400,000 Apps". ^ "Google+ post Andy Rubin". ^ Lunden, Ingrid (7 May 2012). "Google Play About To Pass 15 Billion App Downloads? Pssht! It Did That Weeks Ago". ^ "Google Play hits 600,000 apps, 20 billion total installs". Engadget.com. 27 June 2012. Retrieved 5 November 2012. ^ Zachary Lutz (26 September 2012). "Google Play celebrates 25 billion downloads with 25 cent apps, discounted books, music, and movies". Engadget.com. Retrieved 5 November 2012. ^ Paul, Ian (20 February 2012). "Snappzmarket Alternatives to Download free android apps". Retrieved 20 February 2013. ^ Ward, Brad (May 15, 2013). "Google: 900 million Android activations, 48 billion app installs". ^ "Number of Android applications". AppBrain Stats. AppBrain. Retrieved 4 June 2014. ^ Blattberg, Eric (April 10, 2014). "Now streaming on Sonos: Google Play Music’s 22 million songs". ^ a b Etherington, Darrel. "Google Play Offers Over 5M eBooks And More Than 18M Songs, One Year After Its Rebranding". TechCrunch. Retrieved 4 June 2014. ^ a b c "Country availability for apps & digital content – Google Play Help". Google. Retrieved November 18, 2014. ^ "Google adopts Adobe eBook DRM". Adobe. 6 December 2010. ^ "Google eBooks Help". Changing Hands bookstore. Retrieved 11 November 2014. ^ "Supported reading devices". Google Play Help. Google. Retrieved 12 November 2014. ^ "Read books offline". Google Play Help. Google. Retrieved 5 June 2014. ^ a b "Online Live web chat with mesh". www.minkme.org. Retrieved 7 March 2012. ^ "Offline Viewing on Your Android Device". Support.google.com. Retrieved 29 June 2012. ^ a b "International availability of content". Google Play Help. ^ Nexus 5. Google. Retrieved on 2013-11-24. ^ "Google unveils Nexus 7 tablet, Nexus Q media player". Usatoday.com. 2012-06-27. Retrieved 2012-10-29. ^ "Country availability - Google Play Help". support.google.com. Retrieved 2013-11-01. ^ a b "Ordering Devices on Google Play – Country availability". support.google.com. Retrieved 2013-03-09. ^ "Google turns the Samsung Galaxy S4 into a Nexus phone, coming June 26th for $649". The Verge. Retrieved 15 May 2013. ^ "HTC One with stock Android announced, launching June 26th for $599". The Verge. Retrieved 30 May 2013. ^ "Google Play Newsstand merges Currents, magazines and newspapers on Android today, iOS in 2014". Engaget. ^ "Google Launches Newsstand For Android, Combines Google Play Magazines And Currents Into A Single App". TechCrunch. Retrieved 9 June 2014. ^ Ingraham, Nathan. "Google takes on Game Center with Google Play Games for Android". The Verge. Retrieved 9 June 2014. ^ Kahn, Jordan. "Google announces new Google Play Games app, available starting today". 9To5 Google. Retrieved 9 June 2014. ^ Bray, Tim (30 September 2010). "More Countries More Sellers More Buyers". ^ "Big changes in store for Android Market". ^ Savov, Vlad (2 February 2011). "Android Market Gets a Web Store with OTA Installations, In-App Purchases Coming Soon". ^ "In-app Billing Launched on Android Market". Android Developers Blog. ^ Montoy-Wilson, Paul (12 July 2011). "A New Android Market for Phones, with Books and Movies". Official Google Mobile Blog. Retrieved 3 October 2011. ^ Burns, Chris (29 September 2011). "Android Market Update Released for Honeycomb Tablets". ^ Rodriguez, Armando (16 November 2011). "Get Started With Google's New Music Store". ^ Jeremy Levitt (6 March 2012). "Android Apps Supersized, to 4 GB". iTWire. Retrieved 8 March 2012. ^ "Official Google Blog: Introducing Google Play: All Your Entertainment, Anywhere You Go". Googleblog.blogspot.com. Retrieved 7 March 2012. ^ Kahn, Jordan. "Google Play adds carrier billing for music, movies and books". Engadget. Retrieved 10 June 2014. ^ Ziegler, Chris. "Google Play adds in-app subscription billing". The Verge. Retrieved 10 June 2014. ^ "[#6279670] Deleting apps from My Apps/My Orders – Google Play Help". Google. Retrieved 15 October 2012. ^ "Download: Latest Google Play Store 3.9.17". Android Police. 2 November 2012. Retrieved 12 November 2012. ^ "Free Apps Generate the Most Revenue, Google Play Grows". Maximum PC. 2013-12-23. Retrieved 2014-06-20. ^ Artem Russakovskii (31 October 2014). "[Update: 5.0.37] Google Play Store 5.0.31 Adds More Material Design, Moves "What's New" To The Top [APK Download]". Android Police. Retrieved 24 November 2014. ^ "Android Compatibility". Android Developers. Retrieved 31 December 2010. ^ O'Brien, Terrence (2 May 2011). "Carriers Crack Down on Android Tethering Apps, Rain on Our Mobile Hotspot Parade". ^ Ganapati, Priya (11 June 2010). "Independent App Stores Take On Google's Android Market". ^ "App Install Location | Android Developers". Developer.android.com. 15 March 2011. Retrieved 22 March 2011. ^ "Frequently Asked Questions | Android Open Source". Source.android.com. Retrieved 7 March 2012. ^ Churchill, Sam (10 September 2010). "Android Tablets Need 3G/4G for Market Support". dailywireless.org. Retrieved 9 February 2012. ^ "Amazon Kindle Fire (2012)". PC Magazine. 6 October 2012. Retrieved 5 November 2012. ^ "SNAP Google Play Store for BlackBerry 10 Updated to v2.0.0.2". BerryReview. Retrieved 2014-06-20. ^ "Android.com". Android.com. Retrieved 2012-01-05. ^ "3 ways to install applications on Android without the Market". Maketecheasier.com. 2011-01-28. Retrieved 2012-01-05. ^ "Banned from the Market... ok.". False Dichotomies. Retrieved 26 May 2010. ^ a b Krazit, Tom (2 April 2009). "Google restores tethering app for Android users outside U.S. | Wireless". CNET News. CBS Interactive. Retrieved 26 May 2010. ^ "Google boots Grooveshark from Android Market". CNET. CBS Interactive. 6 April 2011. Retrieved 26 April 2011. ^ "Grooveshark Mobile Music: Android". Grooveshark. Retrieved 26 April 2011. ^ Kumparak, Greg (April 18, 2011). "Grooveshark Back On Android, Bypasses The Android App Market". ^ SpoofApp Banned From Android Market, Google bans SpoofApp. ^ "Google Pulls Yongzh's Emulator Apps Off Android Market". PC Magazine. 29 May 2011. Retrieved 29 May 2011. ^ "Google Has Started Removing Ad Blockers from the Play Store". Lifehacker. Retrieved 31 August 2014. ^ Kaplan, Dan (2012-02-05). "Google employs Bouncer to cleanse Android malware – Applications – SC Magazine Australia – Secure Business Intelligence". Scmagazine.com.au. Retrieved 2012-10-29. ^ "RiskIQ Reports Malicious Mobile Apps in Google Play Have Spiked Nearly 400 Percent". RiskIQ.com. 2014-02-19. Retrieved 2014-06-20. ^ "Google Play Malicious Apps Up 400%", "Google Play Malicious Apps Up 400%." Isssource.com RSS. Industrial Safety and Security Source, 19 Feb. 2014. Web. 29 Apr. 2014. ^ Rashid, Fahmida Y. (2012-07-30). "#BlackHat: Researchers upload dangerous app to Google Play store – Applications – SC Magazine Australia – Secure Business Intelligence". Scmagazine.com.au. Retrieved 2012-10-29. ^ "SMobile Systems Analysis of Android App Store Reveals Massive Potential for Malware and Viruses". prnewswire.com. 22 June 2009. Retrieved 27 June 2010. ^ Vennon, Troy; Stroop, David (22 June 2009). "Threat Analysis of the Android Market". SMobile Systems Inc. Retrieved 27 June 2010. ^ "20 % des applications de l'Android Market demandent l'accès à des données personnelles". Le Monde. France. 23 June 2009. Retrieved 27 June 2010. ^ "The Mother Of All Android Malware Has Arrived: Stolen Apps Released To The Market That Root Your Phone, Steal Your Data, And Open Backdoor". Android Police. Retrieved 22 March 2011. ^ "Malware Monster: DroidDream Is An Android Nightmare, And We’ve Got More Details". Android Police. Retrieved 22 March 2011. ^ "An Update on Android Market Security". Googlemobile.blogspot.com. 5 March 2011. Retrieved 22 March 2011. ^ Aaron Gingrich (March 6, 2011). "The Mother Of All Android Malware Has Arrived". Android Police. Retrieved 2012-02-16. ^ "Google Is Gearing Up To Finally Introduce Play Store Gift Cards And A Wishlist [APK Teardown]". Android Police. 2012-08-15. Retrieved 2012-12-13. 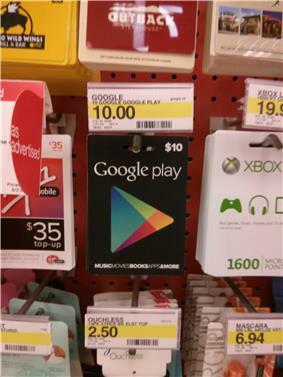 ^ "Google Play gift cards are real – and here's what they look like". Android Central. 2012-08-16. Retrieved 2012-12-13. ^ "Google Play Gift Cards are official, rolling out over the next few weeks". Android Central. 2012-08-21. Retrieved 2012-12-13. ^ "Gift cards & Google Play balance". Google Play Help. Retrieved 2013-09-05.